When I was learning Chinese, it was clear that just working through the beginners’ textbooks wasn’t going to be enough; I needed more practice to build up fluency. So, I devised all sorts of methods to force myself to get out of my comfort zone and start thinking in Chinese as much as possible: I thought up example dialogues in my head, and practised thinking of what I would say in different situations. I would try to interpret what friends said or TV or radio programmes into Chinese on the fly. I even talked to myself in Chinese. But I’m fully aware that a lot of people won’t have the time or the mentality or the energy that I had in ‘training my brain’ to think in and speak Chinese. I have tried synthesise the methods I used to learn to speak Chinese into a solution that other people could use, and that’s what I’ve tried to do with my courses, Plug and Play Chinese Chit Chat and Survive in Chinese. But they can only take you so far. I wanted to produce a solution to help people bridge the gap between functionality in a language and greater fluency, based on the methods I used to build up fluency in Chinese. But somebody got there before me, and that person’s name is Mike Campbell. I’ve been following Mike for a long, long time. He’s lived in Taiwan for more than a decade and speaks several languages to a high degree of fluency. He’s also been active in the language learning community for a long time. I’d bought his French and Spanish courses in the past, so when he contacted me recently about checking out some of his Chinese courses in more detail, I naturally agreed. Mike’s company Glossika produces courses for an incredible range of languages, from French or Italian to Burmese, Lithuanian and almost any language you could mention. On the Chinese side, all his core courses are available in simplified Chinese versions (with mainland China-accented audio) traditional Chinese character versions (with Taiwan-accented audio), and they even offer other Chinese languages/dialects: Cantonese, Hakka, Taiwanese Hokkien and Wenzhou dialect. Mike’s personal passion for language is clear in everything that the company does, from the approach to the products he puts out (I recently picked up a copy of his 10-language/dialect dictionary of Chinese characters – which is a true labour of love, and clearly a project by a real language enthusiast). The core Glossika courses are divided up into Fluency 1, 2 and 3 and the core content is the same, translated into every language the company offers. In each module, there are 1000 sentences written in the language you are learning, IPA (the international phonetic alphabet – a pronunciation guide), Pinyin (the pronunciation system in the case of Chinese) and English. What you don’t really get are vocabulary lists or grammatical explanations. When you pick up one of the courses you get a couple of books (either ebooks or the printed versions) and hundreds of MB of audio files. The books contain detailed introductions to the language, and are very clearly laid out. It’s always good to have as much audio as possible when you are learning a language, and you certainly get a good amount, but what makes this course special is that the audio comes in four versions – A, B and C and another set of files called ‘GSR’. In the A audio, the sentences are said once in English then twice in the target language. In the B audio, they are given in English with a space for you to repeat then in the target language, and in the C audio the sentences are given only in the target language. In the GSR files, each sentence is read first in English then in the foreign language. These different versions of the audio make it possible to use the courses in many different ways. The idea of the Glossika system is that you learn everything in the context of sentences – grammar, vocabulary, idioms, pronunciation and reading, and using the combination of text and audio recordings. 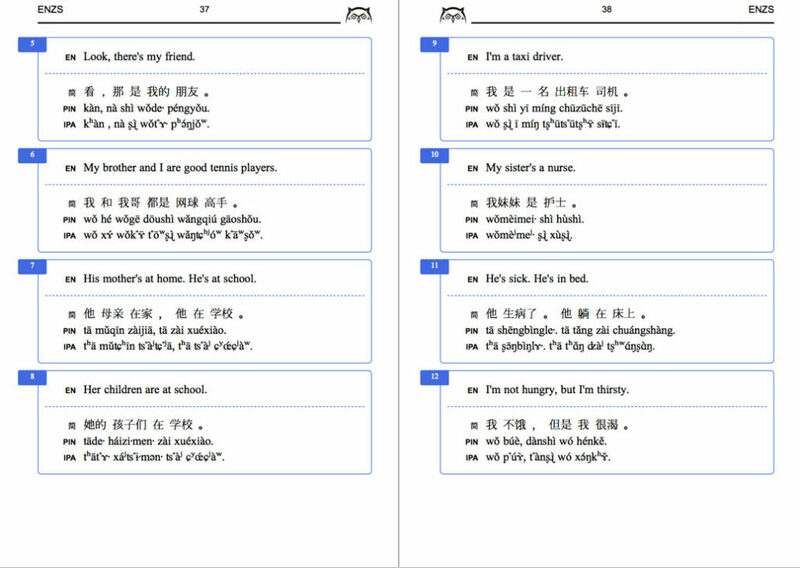 The sentences have been selected to cover all kinds of aspects of daily life, and grammar points such as the past, present and future, active and passive etc. By the time you get to the end of the course, you have covered all the major aspects of grammar without even really thinking about it and the dual language ‘translation’ approach trains you to think in the language and spot patterns. The way that Glossika recommends that you use the courses is as follows. First of all, you listen to the audio all the way through to get a feel for the sound of the language. Then, you start training yourself on 10-20 sentences a day or more if you wish. You first repeat the sentences out loud using the A files, then you try to write out the sentences after listening to the audio, then you record yourself saying the sentences, then finally you listen to the B file and practise interpreting the English sentences into the foreign language out loud. This is a very effective approach, and it is very much in line with my own methodologies for learning languages, so I’m really pleased that this approach is now down on paper and codified for people to start using. However, training yourself in this way is very hard work and certainly not for everybody, so Glossika also provides the less intensive ‘GSR’ files that you can use to listen to the English and Chinese sentences. You are supposed to listen to one file per day, and the files also include built-in ‘repetition’, so you hear the sentences multiple times over a specific time period and you can commit them to memory. The whole course is designed to take 3 months or so to complete. • Mike is obviously really passionate about languages, and this really comes off in the methodology and the attention to detail in the books. • You can choose from Mainland China and Taiwan versions of the Chinese course, with different audio and localised Chinese translations. • Given the sheer amount of audio and practice you get, the courses are not that expensive. • Not for everyone. The courses are not really suitable for complete beginners. They are best suited to self-learners at the post-beginner stage or people who already have a basic understanding of the language. • There are very few grammar explanations and vocabulary lists, so you may need to refer to a separate grammar book. You have to ‘figure things out for yourself’. • The focus is on improving fluency and internalising grammar patterns, the courses don’t cover a large range of vocabulary. • All the audio on the courses seems to be recorded by one person, it would be nice to have both male and female speakers or more of a variety. • Everything is based on individual sentences, they don’t really form dialogues. • Some learners may find the sentence training methodology a little dull. Overall, Mike and his team have produced a great set of courses that do a good job of meeting the needs of post-beginner independent language learners. They work best as a supplement to your language learning arsenal and as a bridge to engaging with real native speakers. In fact, I’m so impressed with Mike’s material that I’m also planning to cooperate with Glossika on language learning courses and materials in the future, so stay tuned!